Greetings from Las Vegas and the 2019 National Association of Broadcasters conference. I start this blog with the actual, official show graphic (above) from this year. It is a truly stunning and ironic acknowledgement of the disjointed nature of what this conference has become. 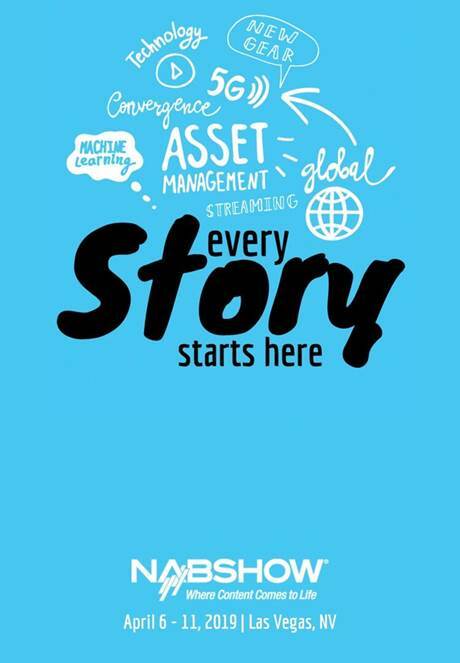 What was once an event about broadcasting (television technology and content) now has bits and pieces of multiple things slapped in where ever they can get them to fit. The importance of this conference to what I personally do has diminished over the years – so admittedly I spent very little time here (one and a half days.) What I write below are the impressions and highlights as I saw them – and admittedly it is far from a comprehensive show review. The largest point to make is the smallest – there are far fewer attendees here then there were in the past. I reported last year that the attendance in the central hall – the traditional broadcaster’s space – was lighter than in the software space in the south halls. Well, this year it was lighter everywhere. The on-site parking lots were half empty (and some of that can be chalked-up to ride-sharing, but not all of it.) The conference organizers offered ‘extended deadlines’ on all their promotions to try and drive more attendance this year, and have already announced that next year’s show will be the first one in recent history that will start on a Sunday instead of a Monday. The bottom line is that this show is struggling to retain an audience. Other new conference topics included the imminent rollout of 5G services and the future of in-car experiences. It looks like the NAB show management is trying to copy the CES themes of earlier this year to expand interest in the show. If I were them I’d try to focus on pure broadcasting and attempt to merge the areas of interest so that all exhibitors could reap the benefits of attendee exposure. That doesn’t appear to be their current strategy. · Automated HD video production – the Pixellot company showed their Pixellot Prime service. 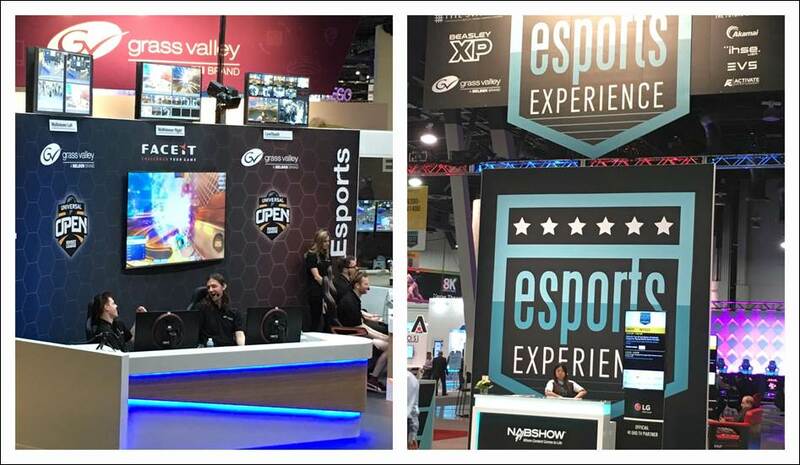 This firm offered automated sports programming for high-school, college and community events in the past, but this new system rivals professional broadcast production for professional sports. Imagine equipping every stadium with this automated service and never needing to hire production crews again. It is a game changer. · 8K cameras are now a common thing, with entries from Panasonic, Sharp, Sony and others. Rather than awaiting 8k broadcasting technologies to be common, these cameras are coping the industrial collaboration trend of being able to do ‘region of interest’ framing of a 4k image within an 8k palette. Adding the AI to do this automatically (like the kind being used by Pixellot above) will also be a game changer for broadcasting. · Editing software from multiple firms is dropping significantly in price. You can get features and abilities that once cost thousands of dollars for a couple of hundred. Is it no wonder why there are less and less exhibitors and attendees at this show. 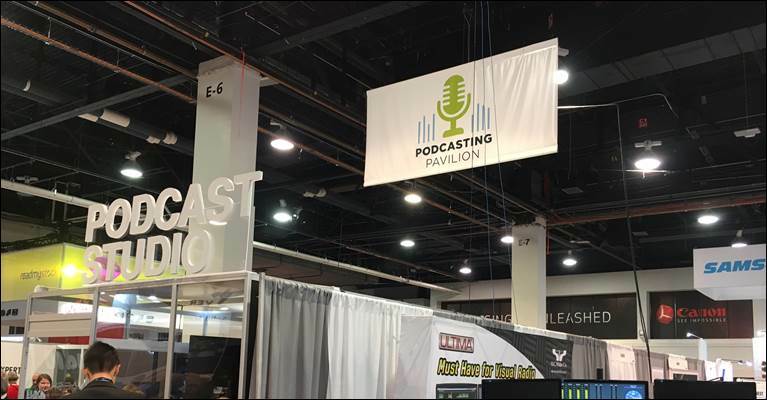 · The word “podcasting” was everywhere, as many exhibitors and manufacturers want to capture this emerging trend of smaller, less-expensive production and distribution method. We’re approaching the time when handheld, lower production value video will be the norm in broadcasting, and traditional production will be the exception. Finally, I felt it important to recognize that, with all the transformational changes in the industry over the last 50 years, some things never change. 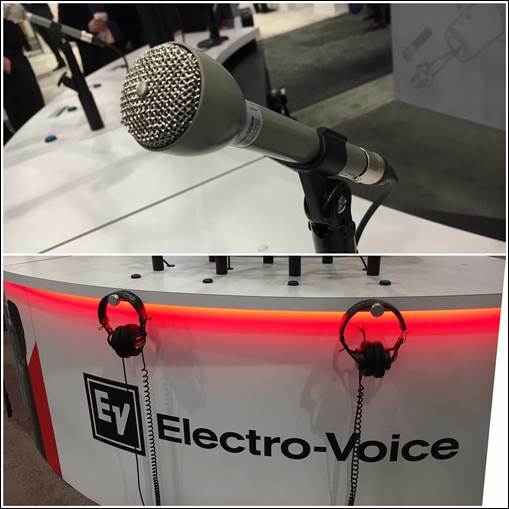 The Electro-Voice booth still proudly showed their 635a microphone – ‘The Hammer’ as we called it, not changed at all from the version I used in staging nearly 50 years ago. Why change perfection…..
That’s it for my brief visit to NAB 2019. Look for my next View From The Road from InfoComm 2019 in June. As opposed to the last number of years, the IMCCA and I are not at all involved in the planning and vetting of the UC track or Emerging Trends day there, as Avixa preferred to handle those tasks internally rather than use an industry accredited group like ours to ensure the quality and value of the track and presentations. We wish them well as they plan an exciting event. The Spring issue of Sound and Communications IT/AV Report will be available at that conference – the first complete issue that I’ve personally edited myself. It is themed around emerging technology, and it’ll be full of some great articles on Team Chat, Data Lakes, Bluetooth, The Changing Corporate Office Floorplan, and will include an engaging and timely Viewpoint debate on general compute vs. appliances for room collaboration. It will also have a few opinion columns from industry analysts and myself on the directions our industry and associations are taking. This article was written by David Danto and contains solely his own, personal opinions. David has over three decades of experience providing problem solving leadership and innovation in media and unified communications technologies for various firms in the corporate, broadcasting and academic worlds including AT&T, Bloomberg LP, FNN, Morgan Stanley, NYU, Lehman Brothers and JP Morgan Chase. 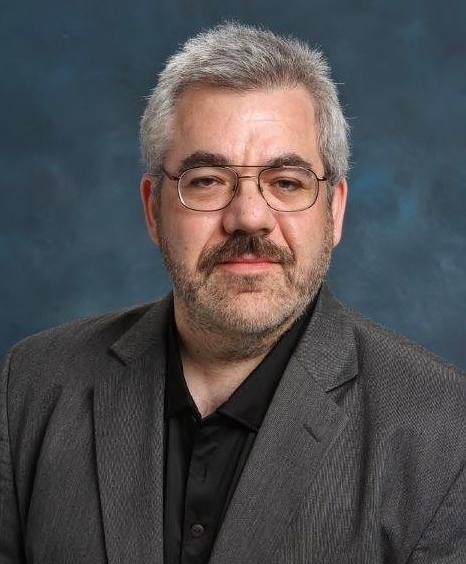 He is the IMCCA’s Director of Emerging Technology and Poly’s Director of UC Strategy and Research. 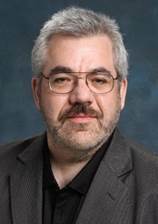 David can be reached at DDanto@imcca.org and his full bio and other blogs and articles can be seen at Danto.info.